Kenneth Mayhew has returned to the soggy, ancestral acres of England to visit kith and kin. But a little bit of extended family goes a long way and Kenneth and Bentley soon escape the auld lang syne by heading north to Scotland. But things are not peaceful over the border and Cill Fhinnein House where they are staying seems to be living under the pall of witches curse and the ghost of her demon dog. Kenneth knows he must lend a hand to help his beleaguered chum, and ghost hunting is more fun than shooting grouse in the rain. One can never predict what will happen in the Gulch so no one is surprised when an injured caver washes up in town needing help from the Bones. But Caver Jim seems to be a man of secrets and Butterscotch fears that he hasn't just gone hunting for some forgotten stalagmites but might actually be there to hunt dinosaur bones. Taking Ricky and Max with her, she goes exploring on Potter's Ridge and discovers something more fabulous and amazing-and dangerous-than fossils of a T-Rex. A light, fun read with an eccentric cast of characters who bring the village of MacIntyre's Gulch to delightful life. Marry in haste and repent in leisure, or so the old saying goes. Jane is not unhappy in her own marriage but a friend from college, a young heiress, had stumbled into a dark relationship which could end up costing her life. 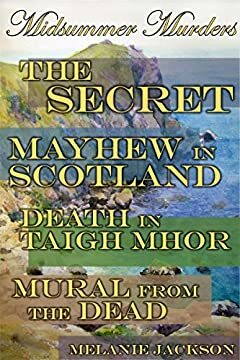 Jane is summoned to Taigh Mhor by a desperate letter talking of malicious spirits and strange accidents. She arrives to find that the unpleasant situation has come to a sinister pass. All her wits will be needed to save her friend from the local evil that wants to see her dead. Melanie Jackson has done it again. The quirky characters you love, the fast-paced mystery, and the unique voice are all there. Sometimes history, though interred with all honors, refuses to stay buried. Or, in this case, plastered and white washed. The earthquake which had dropped a crypt on Miss Henry in San Francisco had done damage elsewhere in the state, and Juliet and Raphael James are headed for Monterey to see the mural exposed by the damages plaster in a famous old adobe house which was the scene of one of California's earliest and strangest robberies.